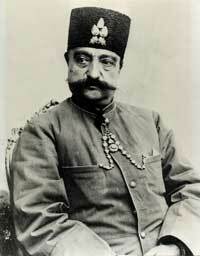 Mohammed Qajar died in 1848, a year of revolution and democracy in Europe. In Iran it brought change too: Mohammed’s son, Nasser al-Din, was only 17 when his father died, and for the first three years, Nasser’s prime minister Amir Kabir held power. Amir Kabir, who had risen from poverty, first centralized power, gaining control of the provinces. Then he separated religion from the state, and protected Christians, Zoroastrians, and Jews. He tried to improve Iran’s financial situation by promoting sugar and cotton growing, and the fishing industry, and he founded a university in Tehran with mostly Austrian professors. Amir Kabir also refused to ally Iran with either Russia or Britain, preferring to stand on his own. Sadly Amir Kabir’s reforms made a lot of enemies, including Russia and Britain, and Nasser al-Din’s mother, Malek Jahan, and she had him killed in 1852. She herself held power after that. 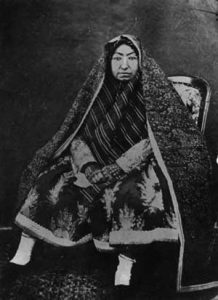 In 1856, she invaded Afghanistan to try to regain land there and counter British influence, but Britain helped Afghanistan to defeat Iran, and even invaded Iran in a counter-attack in 1858. She also brought the first telegraph lines to Iran, but her main interest was in keeping her own dynasty, and Iran’s richest people, in power – rather like Sophie in Austria-Hungary at the same time – not in modernizing the country. 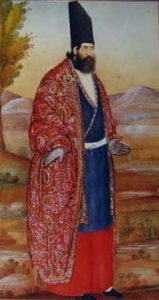 As Malek Jahan grew older, a new vizier rose to power: Mirza Hussein Khan. He was a modernizer like Amir Kabir, but to get money for modernization Mirza Hussein sold the rights to all kinds of things – the tobacco trade, fishing rights, railway building – to British and Russian investors. But after Malek Jahan died in 1873, Mirza Hussein also lost power in Iran. Still the same tendency continued: Iran got less and less independent; more and more like a colonized country, even without ever having been defeated in war. Cite this page: Carr, K.E. Nasser al-Din – history of Iran – 1800s AD. Quatr.us Study Guides, September 11, 2017. Web. April 25, 2019.